The Finger Lakes region is known for its beauty, but look carefully and you will discover some of New York’s other abundant — and unusual — treasures. The cliffs of Excelsior Glen are scattered with ancient pictographs, and Bluff Point conceals the ruins of an unknown civilization. The wine industry has its own strange stories; discover why one wine producer was banned from using his own name. Among the oddities of the Finger Lakes region are the world’s largest pancake, a slice of Susan B. Anthony’s seventy-eight birthday cake and the anecdote of the boy who accidentally caught an eight-pound trout with his nose. Join author Melanie Zimmer and uncover these and other curiosities of the Finger Lakes. Read these stories and many more in Curiosities of the Finger Lakes. The book contains 160 pages and abundant images. Order it now for $19.99. 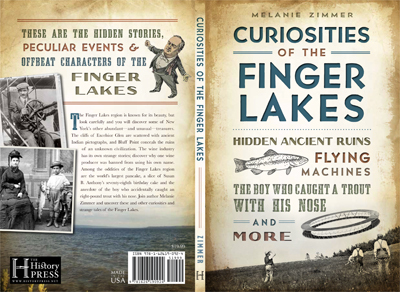 Please contact Melanie Zimmer for book signings or readings for Curiosities of the Finger Lakes.